There's a lot of power in threes. For Americas Cardroom, it's never been truer with the announcement of its OSS Cub3d. Running February 10th through March 10th, it features three tournament series, three leaderboards, three Main Events and more than $8 million in guaranteed prize pools. "Our insanely popular tourney series is back and we're upping the ante with two big $1 million GTD tournaments, plus lots of chances to win a seat in our upcoming $5 million GTD event." stated Michael Harris, spokesperson for Americas Cardroom. 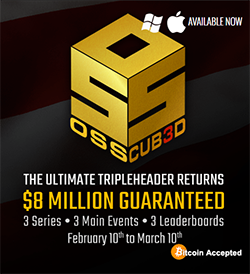 The OSS Cub3d is Americas Cardroom's 3-part online poker tournament series. It consists of the smaller stakes Mini Online Super Series (MOSS), flagship Online Super Series (OSS), and high roller Bigger Online Super Series (BOSS). The MOSS runs from February 10th through 17th. The OSS goes from February 18th through March 3rd. And the BOSS from March 4th through 10th. This time around, Americas Cardroom is including two $1 million guaranteed tournaments. There's a $540 buy-in on March 3rd as the OSS Main Event, and a $2,100 buy-in on March 10th to close out the BOSS. But the OSS Cub3d is greater than the sum of its parts thanks to three leaderboards (MOSS, OSS, and BOSS). A total of 10 players will earn a $2,650 seat in the $5 Million GTD Venom tourney coming later this year (download the poker client for more info). Get warmed up for the OSS Cub3d with a special 50% reload bonus up to $300. Use code BACK when depositing from February 17th to 23rd to claim your bonus.